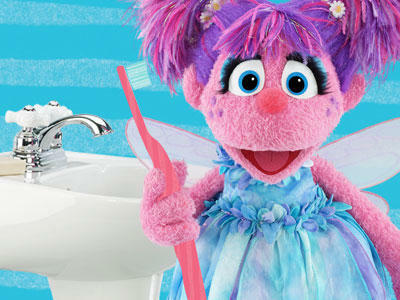 Abby Cadabby and a host of other Sesame Street friends share a song and video about brushing teeth. In true Sesame Street fashion we are engaged and encouraged to have toothbrushing become a part of the daily routine. This is just one of a host of parent and caregiver toolkits which cover topics from Asthma and Autism to Grief and Divorce. These toolkits have been developed to help adults explain hard topics with their children. These kits are available online at Sesame Parent Toolkits. The topics covered in the toolkits are presented with video clips of beloved Sesame characters coping with the topic issue: Big Bird looks at food insecurity and goes with his grandmother to a food pantry, Elmo talks about his sadness at the death of his uncle. Coupled with those video clips are video segments of real families dealing with these challenging issues. The content in these toolkits comes complete with songs and problem solving ideas that is part of the Sesame formula. If you are looking to talk with your child about a difficult subject, these toolkits might just give you a context to begin that talk.